This time I will start with some very basic stuff: major and minor chords. Every guitar beginner soon learns that there is e.g. an A major chord, and an A minor chord. Obviously they are similar, they just differ in one single note (in case of the first position chords, in the example it is either the 2nd (A) or 1st (Am) fret on the b string). The minor and major chords only differ in one note, this is the third note of the corresponding scale. You need to understand that both a major and a minor chord consists of three different notes: the first, the third, and the fifth note of the corresponding scale. Since a guitar has 6 strings, any guitar chord can consist of up to six notes, but in case of a simple major or minor chord, there are only three DIFFERENT notes (e.g. the first position A major chords has the notes – low to high – E A E A C# E = three different notes. Let’s leave the basics now. Besides major and minor, there is another possibility: Any major or minor chord can be played in such a way that there is no third (=the third note of the scale) at all, e.g. play a normal open position A chord, but dampen (or do not hit) the b and the high e string, or press down the d and g string on the 2nd fret (with your index finger), and the b and high e string on the 5th fret (with the pinky). In both cases the chord will consist of only TWO different notes (E and A), which are 1 & 5 of the scale, but no third. Since it was the third that determines whether the chord is major or minor, these chords are neutral so to say – they are neither major nor minor. Often these chords are called power chords. So, why this name, and what are they good for? Especially in combination with a lot of distortion, the third often adds some weird sounding harmonic effects, in other words, power chords sound better for heavy stuff. For this reason they often replace both major or minor chords in all kinds of music that rely on distortion. Mark Knopfler also uses them a lot, e.g. most chords in Money for Nothing are power chords. 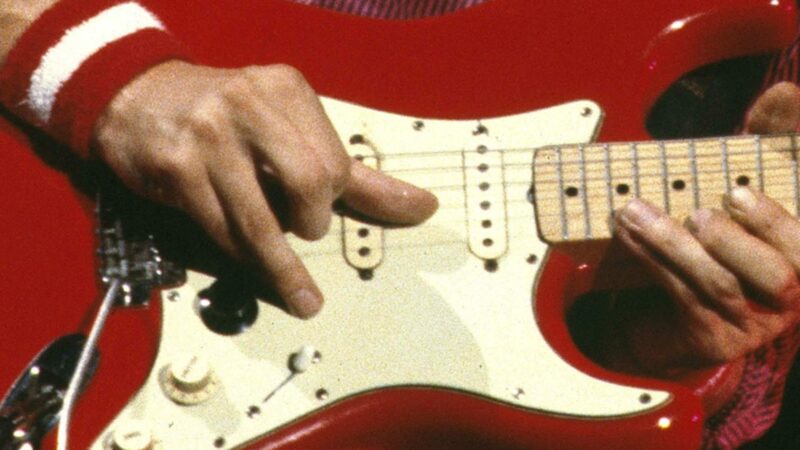 Another aspect is that – as the chord itself is “neutral” – you can play lead with major scale or minor scale licks, as you want, both will match the chord nicely – but of course sound completely different. This is something that happens in the Dire Straits song Calling Elvis quite a lot. The key of the song is B (major or minor would indeed be a valid question here). The third note of the scale can be a D# (major) or a D (minor). Note that in fact both appear at differents parts of the song, e.g. the verse makes use of the D (just listen to the vocals melody), or the guitar run at the stop in the middle of the song also contains the D, while that fast, repeating pedal steel lick between the verses has the D#, but no D. We can say the song moves from minor to major, and back. Similarly, it is really a question whether Money for Nothing is G major or G minor. Most other chords in this song are a hint towards minor, but the E chord at the end of the refrain points toward major. It is important to be aware that nobody in the band plays the third of the G chord*, be aware that a Gm on the rhythm guitar would really spoil this effect. The G is rather neutral here. I remember reading somewhere that Mark used to direct the band shouting “no thirds, no thirds” on a recording session. It is really helpful to be aware of this often neglected aspect of song writing, and of some new possibilities resulting from it. ⟵The Dan Armstrong Orange Squeezer compressor – Did Mark Knopfler really use it? Doesn’t the fact that the bass is playing minor thirds indicate that money for nothing is in g minor? Hi Morten, in fact Money for Nothing is G minor, the intro also clearly indicates minor. And you are right, the bass plays a Bb in one of the runs over the verse, but since this Bb is only a short connector and not a sustained note, the verse still has the feel and sound of a no-third chord. This no 3rd business occurs in many other songs as well, such as Why Aye Man, Fare Thee Well Northumberland and Coyote. It’s often to create a bluesy mood I reckon. They are neither major nor minor chords/scales. They are dominant. Just like most of the blues songs for that matter.